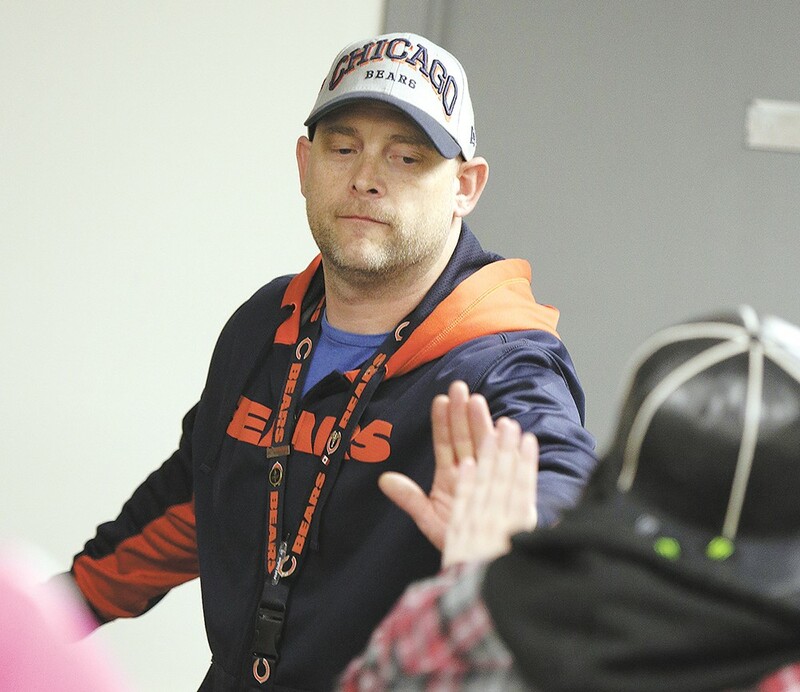 Counselor Jayson Kappen at Daybreak Youth Services high-fives a client in April, shortly after a new funding system for drug treatment centers went into effect. It was an idea that seemingly everyone agreed with. Since people treated for drug addiction so often end up being the same people treated for mental health issues, it's only logical, the thinking goes, that the dollars for those services come from the same place. So state lawmakers came up with a plan: By 2020, the state will fully integrate funding and delivery of services for mental health, chemical dependency and physical health in the Medicaid program. In the meantime, the state would create nine separate Behavioral Health Organizations that are responsible for administering dollars for two of those services: mental health and drug treatment. Previously, the state directly contracted with drug treatment services. The state Legislature easily passed a bill founded on this idea two years ago, and on April 1 of this year, the creation of Behavioral Health Organizations, or BHOs, went into effect. "It doesn't make sense to have a system that treats mental health or chemical dependency as separate from other health care needs," Gov. Jay Inslee said in 2014. "Not only is it an inefficient way to provide health care services, it's ineffective." But already, just five months in, several drug treatment providers in the area say the change has created some unintended consequences. For some providers, the length of stay for kids in drug rehabilitation has been significantly reduced under the new system. For others, referrals to the program have gone down to levels never seen before. Christine Barada, director of Spokane County Community Services, says the BHO is working to address these concerns. "We support this behavioral health integration," Barada says. "Any major change like this does affect entire systems of care." Since April 1, the length of stay for kids seeking drug treatment at Daybreak Youth Services in Spokane has decreased by about 20 days, says Executive Director Annette Klinefelter. For some kids, a shorter stay is adequate. But Klinefelter says Daybreak is having a harder time making the case to the BHO on behalf of kids who may not have stable housing to transition to, or who need more treatment. In cases where Klinefelter says it's "morally reprehensible" to release a child, Daybreak will take more extreme measures. "There are occasions where it is so absolutely vital that the child stays that our board will utilize philanthropy and scholarships for extra days," Klinefelter says. This, she says, is in contrast to Daybreak's office in Vancouver. Clark County is one of two state counties (Skamania is the other) that, instead of joining a BHO, became an early adopter of the fully integrated care that's going into effect across the state by 2020. Integrated care means the state purchases both physical and behavioral health services together, ideally leading to more coordinated health care for clients. The Spokane BHO consists of seven counties: Spokane, Pend Oreille, Okanogan, Ferry, Lincoln, Adams and Stevens. People who may be on the Behavioral Health Organization advisory board include family members who may have had issues with mental health or addiction, retired clinicians, doctors, or experts in the field. And that board, says Barada, really is advisory to the Spokane County Board of Commissioners. Daybreak isn't the only drug treatment center experiencing issues with the BHO in Spokane. Amber Teichroeb, who oversees the drug treatment residential program at Excelsior Youth Center, says that joining the BHO has led to more hoops to jump through when trying to authorize a longer stay for patients. Before, Teichroeb says they didn't have to justify why a kid stayed in treatment unless they had been there more than 120 days. Now, they're frequently having to reauthorize kids every two weeks. "We often take kids that have done more short-term-stay programs. We work with highly acute kids that have exhausted other resources," Teichroeb says. "If the expectation is to have a shorter length of stay, it's a little concerning." Art Jacobs, administrator for Isabella House, a residential substance abuse treatment center for women and children, describes the the length of stay under the BHO system as a "challenge." Typically, he says, they want women to stay for around six months. The BHO has been more strict than the state in getting authorization to go through, he says, but that has improved even within the first five months. "It has been an uphill battle and an uphill climb, but we have gotten to the point where we understand the needs of the agencies and we're moving in the right direction," Jacobs says. The BHO standards for length of stay come from the American Society of Addiction Medicine. Barada, whose department in Spokane County provides staff support for the BHO board, says that they're requiring an update on client needs after 15 days before determining if there will be an extension of 15 or 30 days. She says that several providers have already approached the BHO concerned about the more stringent standards. "Quite a few have a concern about the length of stay and the process of having to ask again for an extension," she says. She notes that a longer stay for someone seeking drug treatment doesn't necessarily always mean better outcomes. "We want this to be really successful," Barada says. "The intent is not to reduce individuals' care. The intent is to support them in recovery." Andrew Hill, CEO of Excelsior, is concerned about more than the length of stay under the BHO. "What we're seeing the most significant change in is the number of referrals for services," he says. Hill says Excelsior typically had a waitlist of 10-12 kids. Now, they have just 11 kids total at Excelsior. That's worrisome because, as he says, "youth didn't stop needing services." The difference is that now, instead of having a contract with one entity — the state — they now contract separately with each of the BHO regions. "All of those historical relational building blocks that had the system working are totally redesigned," he says. Still, Jeff Thomas, CEO of Frontier Behavioral Health, says the integration of substance abuse and mental health services is "absolutely a good thing." He calls it a "logical and necessary step" in the direction to full integration, like the kind practiced in southwest Washington. While Frontier hasn't experienced any significant changes with the switch to a BHO system, Thomas acknowledges that the change in how funding is administered to substance use disorder centers will come with hiccups and learning curves. Even Hill, while concerned about the number of referrals to Excelsior, says that some of these issues will get better with time.